In today’s article, we will be moving on to the second of three main categories of anemia. In our previous article, we talked about microcytic anemia. Today, we will be discussing normocytic anemia. Just like with microcytic anemia, normocytic anemia is often asymptomatic and is often coincidentally stumbled upon on screening laboratory testing. Always remember that no matter what type of anemia is found in a patient, it should be treated as a sign, not a disease, and further investigation is warranted to elucidate the underlying etiology. Even though most cases of anemia start out in the normocytic category, there are several etiologies in which the MCV remains in the normocytic range of 80-100 fL. There are several etiologies of normocytic anemia, but these first few are related to diseases that lead to a decrease in the production of red blood cells. Anemia of chronic disease (AOCD) is the most common underlying etiology of chronic normocytic anemia and is the second most common type of anemia worldwide. The majority of cases of AOCD will be normocytic, but as we discussed in the last article, some will be microcytic. Many chronic medical conditions can be the underlying cause of AOCD. These include inflammatory diseases, cancers, infections, and systemic conditions. Several endocrine conditions such as hypothyroidism, pituitary or adrenal insufficiency, and hypogonadism all can lead to reduced bone marrow function, leading to normocytic anemia. Acute or chronic renal failure can precipitate normocytic anemia due to an excess of uremic metabolites causing the lifespan of RBCs to be decreased as well as reduced erythropoietin production. Another group of etiologies of normocytic anemia are those that cause an increase in the destruction of red blood cells or increase in the loss of red blood cells. Hemolytic anemias are often categorized as congenital or acquired. Congenital hemolytic anemias include sickle cell disease, hemoglobin C disease, RBC enzyme deficiencies, and RBC membrane disorders. 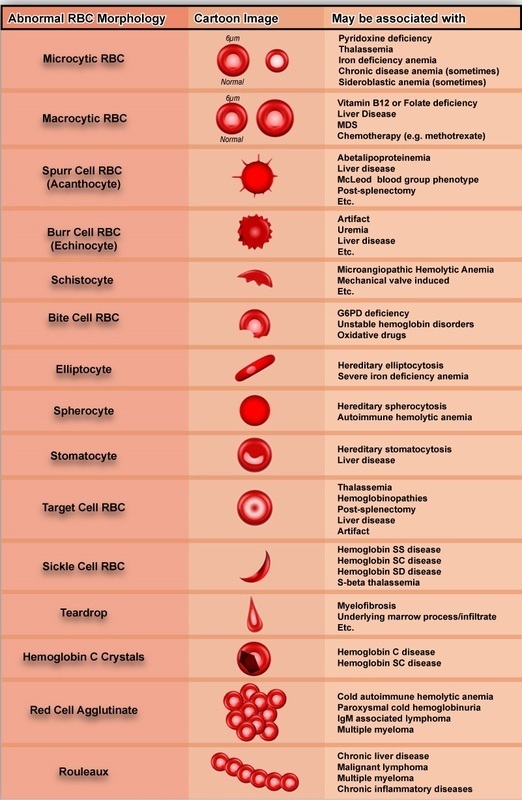 The most common cause of hemolytic anemia in children is sickle cell disease, and due to the advancing treatments, this disease is becoming a common etiology of hemolytic anemia in adults. Hereditary spherocytosis is the most common RBC membrane disorder.It will often present in childhood with anemia, splenomegaly, and jaundice. Other signs and symptoms include gallstones, delayed growth, and dysmorphic features. The most common RBC enzyme deficiencies include glucose-6-phosphate dehydrogenase and pyruvate kinase deficiencies. The most common type of G6PD deficiency in the United States is the southern Mediterranean variety known as “favism,” and is less severe, but affects around ten percent of African American males. Those with G6PD may experience an acute hemolytic experience after exposure to causes of oxidative stress including sulfa medications, phenazopyridine (Pyridium), nitrofurantoin (Macrobid), or antimalarial medications. Acquired hemolytic anemias include mechanical hemolysis, autoimmune hemolytic anemia, and paroxysmal nocturnal hemoglobinuria. Medications that can cause autoimmune hemolytic anemia in predisposed individuals include methyldopa, penicillins, cephalosporins, erythromycin, acetaminophen, and procainamide. Acute normocytic anemia can occur after considerable blood loss, such as after a severe bout of gastrointestinal bleeding, bleeding from a wound, bleeding into a hip fracture, or retroperitoneal bleeding. Hypersplenism can lead to normocytic anemia after the spleen increases its size by three to four times. This can occur due to cirrhosis, myeloproliferative diseases, or chronic infection. The anemia associated with hypersplenism is often caused by the removal of red blood cells from circulation, but also by an increase in the destruction of red blood cells. The diagnosis of the underlying etiology of normocytic anemia can be difficult. It can often feel like you are “shotgunning” laboratory studies. Not only are there causes that lead to pure normocytic anemia, but a mixture of etiologies at one time can cause normocytic anemia (macrocytic + microcytic = normocytic), and even classic causes of microcytic or macrocytic anemias can present as normocytic anemia if you catch it early enough. A practical first step in the diagnosis of normocytic anemia is to look at the red cell distribution width (RDW). If this value is low or normal (homogenous), this is often more consistent with anemia of chronic disease, whereas if it is elevated (heterogeneous), it can be more likely related to hemolytic anemias. A reticulocyte count also can be helpful, where a decreased level can point towards bone marrow insufficiency, suppression, or aplastic anemia, and an elevated level can be due to hemolysis or blood loss. Another common test for normocytic anemia evaluation is the peripheral blood smear. This test will often find cellular changes or features that will point us to a diagnosis. Findings on a peripheral blood smear may include shift cells, target cells, basophilic stippling, burr cells, spherocytes, elliptocytes, schistocytes, bite or blister cells, or nucleated red blood cells. Other tests may include an LDH, fractionated bilirubin, haptoglobin, TSH, creatinine and GFR. As mentioned above, sometimes you also will need to look at the microcytic and macrocytic causes as well, so you may need to complete iron studies, vitamin B12, folate levels, homocysteine, and methylmalonic acid levels. UpToDate. Approach to the Adult with Anemia. Accessed: April 30, 2018. Treatment of normocytic anemia relies upon finding the correct underlying etiology for the anemia itself. These may include avoiding a specific trigger that is causing hemolysis, correction of iron, vitamin B12, or folate deficiency, or a splenectomy. Others may need treatment with exogenous erythropoietin in association with a referral to hematology. As hit on several times prior, normocytic anemia can be a tough finding to crack on laboratory results. Many things in medicine are not black and white, and this is definitely one of those things! 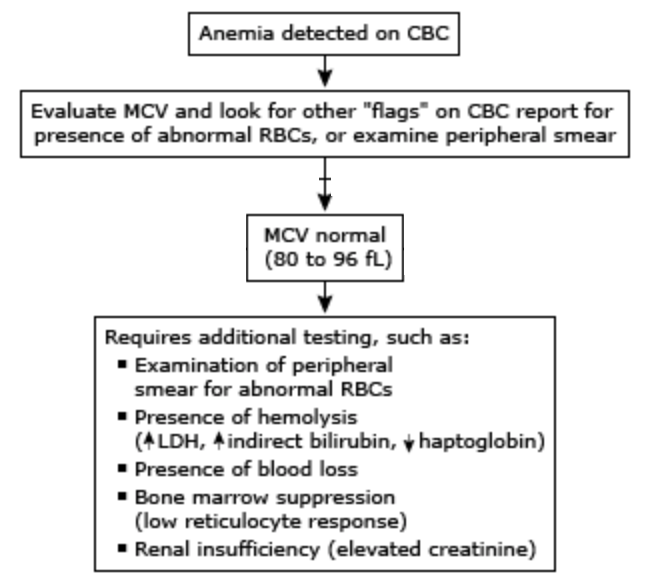 American Family Physician, Normocytic Anemia, 2000 Nov 15;62(10):2255-2263.